The value compared to what institutions just paid and what the stock opened at is a very nice built-in discount. The scare that Lyft shares will crash when Uber comes public are overdone as this is not new information. Lyft and Uber look to be forming a duopoly with long-term growth prospects few companies can boast as disruptors. Lyft Inc. (NASDAQ:LYFT) has had a bumpy start to its life as a public company as its IPO has seen more volatile ups and downs in a week than most companies experience over the course of a year. Currently, this high volatility is allowing investors to buy into the company near a possible bottom as no new information has come out about the company that was not already known when institutions stepped all over each other to buy into the IPO. Uber Technologies' (UBER) coming public shortly after Lyft's IPO should be a surprise to pretty much no one, and there is no reason that both companies cannot flourish over time as disruptors in their own ride-sharing spaces. Lyft filed its S-1 form to come public on March 27, 2019, and came public on March 29th at an IPO price of $72 a share, giving the company an initial public valuation of ~$24B as it raised about ~$2.2-2.5B for future growth initiatives, depending on if additional optional shares were grabbed from the underwriting companies in the deal. After its IPO, Lyft will have over 284 million shares of class A and class B stock outstanding, with only 30,770,000 of the class A shares being offered in the IPO with an additional 4,615,500 million shares possibly sold by underwriters if demand was strong enough. This means that only about 11-12% of the company's total shares will be on the market to be freely bought and sold as most of the other shares will be unavailable to market participants until lock-up periods expire. With such a small float of tradable shares, I would expect continued high levels of volatility for the stock in the coming months, which have already been seen in the first week since Lyft completed its IPO. 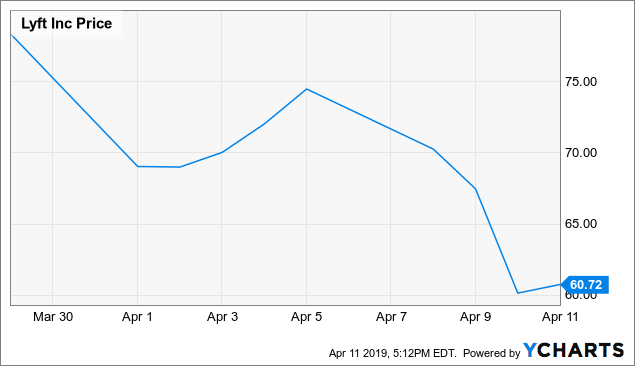 When Lyft came public on March 29th, initial shares were bought and sold at $87.24 a share, a full 21% over the IPO price of $72 a share that institutional investors bought in at. Shares were sold rapidly over the next couple of days, bringing the stock under its IPO price, which was a little surprising, given how many shares were sold to institutions at $72 in what was seen as an "oversubscribed" deal as the IPO price had been raised to $72 from initial projections by Lyft for an IPO pricing more around the $62-68 level. After a dip to around the IPO level and a small rebound over the next couple of days, Lyft has taken another significant ~18% leg down from that rebound down to the little over $60 a share level. It appears that the stock might consolidate here for a little bit, before making another possibly significant move either up or down. This looks like an opportune time for investors to take a position in Lyft as the downside risk should be much more contained now than during the IPO frenzy, while it still maintains the upside that institutions were falling all over themselves for just a week ago. Currently, at about ~30% discount from its opening public market trades and over ~15% discount to what institutional investors paid, it might be a great time to pull the trigger if investors believe in the long-term prospects of the company. With only ~30-35 million shares being traded around, volatility should be fun to watch as over 10 million shares are still being traded daily in the name. Bigger name institutions that bought into the IPO might be loath to sell their shares for the simple fact of why go to all the trouble to win those shares from the underwriters just to turn around and sell them a week or two later. The underwriting banks might not give these selling institutions the opportunity to buy shares in future IPOs like Uber if they are concerned that the buyers will potentially just turn around and sell the shares after a week or two. One more likely concern for investors is that institutions might be shorting some of their shares at this time to form a hedge going forward to protect their holdings from extreme volatility. Hopefully, most of these hedging strategies will be fully worked out in the first week or two before the stock stabilizes some and moves more on market information. Another short concern is the fact that Uber has just filed for its IPO, giving rise to the fear that investors in Lyft might be tired of owning that stock already and might sell to jump into an Uber stake instead when it comes public at the beginning of May. Uber will be looking for a $90-120B valuation (~$100B valuation most likely at this point), which would raise ~$10B in funds for the company for future growth. Nothing in these most recent Uber releases should be considered surprising for investors in Lyft as it seemed that both companies were biding their time, waiting for an opportune time to enter the public market. Instead of Lyft investors exiting their stakes for Uber when it comes public, I wouldn't be surprised to see many investors simply pick up some of the stock of both companies as they both have different strategies moving forward in what is turning more and more into a potentially lucrative duopoly over time. Finally, there is the "profit" problem that both Lyft and Uber share, and that isn't going away anytime soon as they continue to grow at all costs. This has resulted in Lyft grabbing ~$2.2B in revenue in 2018, resulting in a ~$910M loss while focusing on over 300 unique markets in the U.S. and Canada. Lyft had about ~1.9M drivers in 2018, giving out over 30M rides as it continues to grab market share from Uber in North America. Uber reported ~$11.3B in 2018 revenue with an adjusted EBITDA loss of ~$1.85B. Lyft celebrated 1 billion delivered rides in September of 2018, while rival Uber reached its 1 billion rides delivered mark in 2015. Uber's strategy is markedly different from Lyft's as it currently operates in over 65 countries (with exposure to at least 15 more) as it is seeking a more diversified global strategy whereas Lyft is more focused on primarily the North American market. Lyft is also using more of a ride-sharing pure-play strategy whereas Uber is diversifying out globally and into other areas of interest such as Uber Freight. Lyft has had a volatile start to its life as a public company, with there currently being a very opportune time for investors to get into this disruptive growth company at prices significantly lower than at its IPO. No new information has come out that should dissuade potential investors at this time as Uber's upcoming IPO soon after should have been fully expected by the market, and neither company should be overly concerned with making profits at this time as their disruptive growth is building distinct moats for both companies at this time. Hedging strategies by institutions should be finishing up by this time as things potentially start to settle down, giving investors a great chance to own Lyft now at an incredible value and possibly Uber later on when it comes public. I recently bought a standard position in Lyft for my portfolio in the low $60s a share and would consider adding to my position if the stock falls into the $50-55 range. I also plan on buying a position in Uber as well when it comes public. Best of luck to all. Disclosure: I am/we are long LYFT. I wrote this article myself, and it expresses my own opinions. I am not receiving compensation for it (other than from Seeking Alpha). I have no business relationship with any company whose stock is mentioned in this article.